March 21, 2011 - Devon Samuels, 45, a U.S. Customs and Border Protection (CBP) officer of Stockbridge Georgia, pleaded guilty Thursday in federal court to conspiring to launder drug money and attempting to smuggle guns onto an airplane. Samuels and his wife, Keisha Jones, 30, also of Stockbridge, Georgia, both also pleaded guilty to conspiring to commit marriage fraud in a separate case in federal court on Thursday. "Our citizens expect the federal government and its agents to protect the borders, and not use their badges as personal gateways for getting cash," said U.S. Attorney Sally Quillian Yates for the Northern District of Georgia. ?In this case, a federal customs officer smuggled guns and drug money for people he thought were international narcotics traffickers. At about the same time, he and his wife were running a corrupt marriage business on the side. Such officers can expect to see federal prison." Samuels, while working as a CBP officer, was charged in connection with three undercover sting operations with smuggling drug money and guns through Atlanta's Hartsfield-Jackson International Airport. On Nov. 3, 2010, an undercover officer, posing as a drug money launderer, gave Samuels approximately $25,000 in U.S. currency represented to be from the sale of drugs. With the assistance of others, and by unlawfully using his badge to bypass security and avoid screening, Samuels smuggled the money through Atlanta's airport to Jamaica. Once in Jamaica, Samuels delivered the money to a Jamaican undercover police officer who was posing as an international drug trafficker. On Nov. 19, 2010, Samuels accepted over $50,000 in purported drug money from another undercover officer. He then traveled from Atlanta to Jamaica, where he delivered the money to Jamaican undercover police officers. 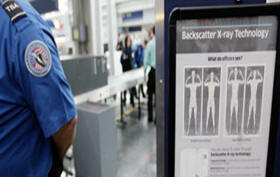 While in Atlanta's airport, Samuels again unlawfully used his badge to bypass security and avoid being screened. Finally, on Nov. 30, 2010, Samuels accepted five firearms and approximately $20,000 in alleged drug money from an undercover police officer. Samuels smuggled the firearms and money into the airport by using his badge to bypass security. Once inside the airport, he gave the firearms and money to a second undercover officer who had told Samuels that she was going to transport the firearms and money to Arizona for a meeting with members of a Mexican drug cartel. In the marriage fraud scheme, beginning in Nov. 2009, Samuels used his knowledge of immigration policies to assist Carlton Ferguson, 35, and Dahlia McLaren, 30, both of Decatur, Ga., to deceive U.S. immigration authorities into believing that their sham marriage was genuine. Samuels and Jones were also paid to falsely complete the immigration paperwork necessary for McLaren to obtain U.S. citizenship through her sham marriage to Ferguson. Both Ferguson and McLaren have pleaded guilty to conspiracy charges and await sentencing. Samuels pleaded guilty to conspiring to launder money, for which he could receive a maximum sentence of 20 years in prison and a fine of up to $500,000. He also pleaded guilty to attempting to carry a weapon on to an aircraft, for which he could receive a maximum sentence of 20 years in prison and a fine of up to $250,000. Finally, Samuels and Jones have each pleaded guilty to one conspiring to commit marriage fraud, for which they could receive a maximum sentence of five years in prison and a fine of up to $250,000.